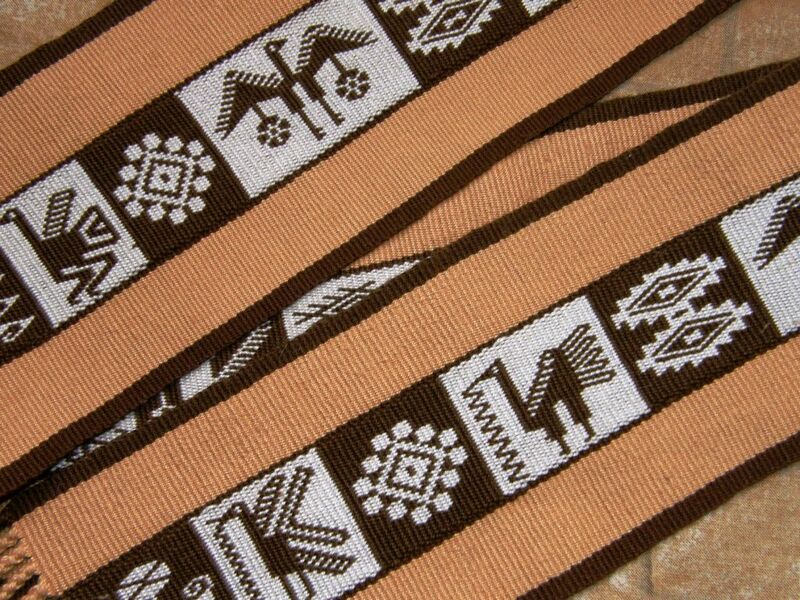 Only the brown and white pattern area in this sash is woven in double weave. The solid color surrounding area is warp-faced plain weave. The same goes for the above pieces. 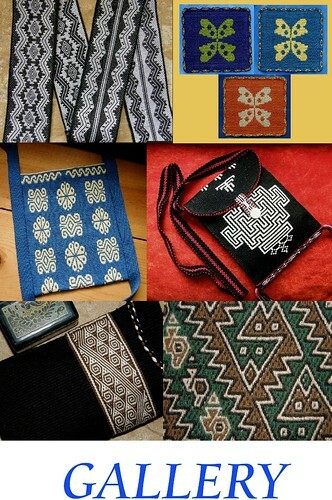 The long black and white table runner above left has a band of double weave with the Abba Yohanni motif in the center and is flanked by warp-faced plain-weave. 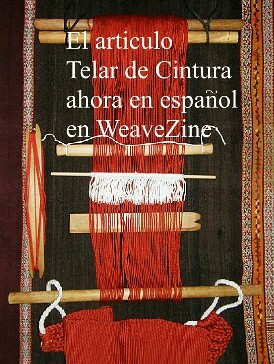 Above right is a Mapuche double weave-motif embedded in beige and red plain-weave. I like to use this technique for narrow bands too as I like the way the plain-weave border frames the double-weave patterns in both color and relief. The llama charts can be found here and the lettering charts here. The main difference between this technique and the one-weft double weave method is that here we use TWO wefts. 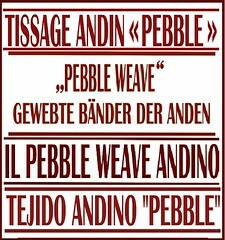 One weft passes from edge to edge, that is, the entire width of the weaving and weaves the plain-weave and the upper layer of the double weave. I will call this the MAIN WEFT in this tutoraial. A second shorter weft, the SECONDARY WEFT, passes only from edge to edge of the double-weave pattern area and weaves the lower layer of the double weave. I have made a tutorial with step-by-step pictures to show you how to weave a solid color background in the two-weft double weave technique. I also have three videos which complement these instructions. AS THIS IS AN INTERMEDIATE LEVEL TECHNIQUE, I recommend working up to it by first following the tutorial on warp substitution followed by the one-weft double weave technique. Weave several samples in these techniques before attempting this tutorial. 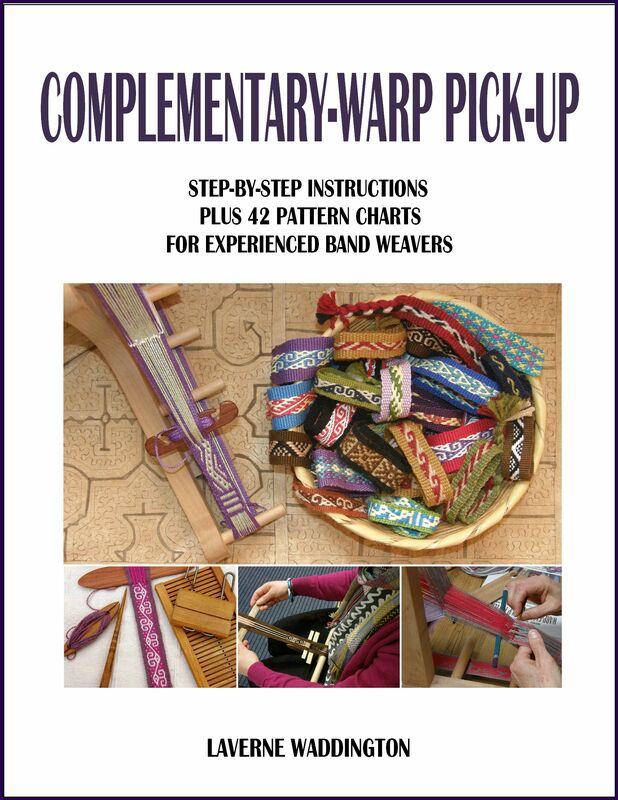 The instructions here are for weaving a narrow band with a scroll pattern. 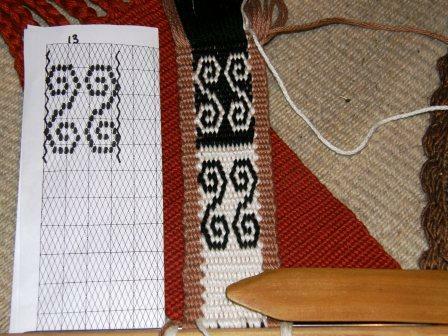 The black and white section is in double weave and the tan borders are in warp-faced plain-weave. I have used a heavy-ish mercerized cotton (13wpi) for this tutorial for the sake of getting good clear images. It makes quite a clumsy thick band. I recommend using medium-weight yarn for your first samples. (perhaps #3 crochet cotton). Revs=revolutions…the path of the warp from the first warping stake to the second and its return journey is called a “revolution” in this tutorial. I am recommending a narrow border of 2-4 revolutions. I think that 4 revolutions looks nice. This pattern is made up of thirteen warps. Count the diamonds between the heavy black zig zag lines-each one represents a warp. 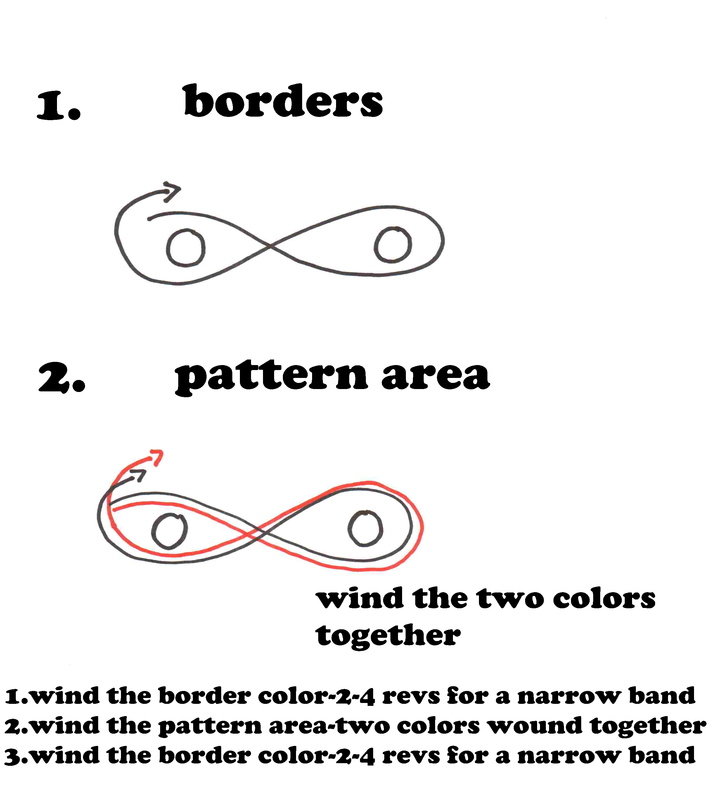 So, to weave this pattern you would make thirteen revolutions with the two pattern colors. Above left is the warp with the cross sticks in place. Above right the string heddles have been made and the shed rod is in place. (I have not gone into a lot of detail here as this is an intermediate level tutorial and I assume that terms like cross sticks, heddles and shed rod are not new to you). Instructions for weaving a plain white background. The upper layer of the double weave will be white and the lower layer (the underside of the weaving) will be black. Later we will choose black warps to form the design on this white background. Each shed comprises pairs of black and white warps. I need to select and keep all the white warps in each shed so that these will appear in the upper layer. The discarded black warps will appear in the lower layer, or underside, of the weaving. Above left: I have opened the stick shed and have inserted my left hand under all the warps in this shed. Above left you can see that all the tan border warps are passed to my right hand. You can also see that each white warp has a black partner. Above right: I am selecting and keeping all the white warps to form the upper layer while discarding the blacks. I have kept the first four white warps having discarded their black partners. I move each white warp to my right hand as I work my way across. Above left: I have kept all the tan border warps as well as all the white warps and have discarded all the blacks. I have placed my sword within this shed and will beat. Above right: I am passing the MAIN WEFT through this shed from right to left. (The direction in which you choose to pass the first weft is of no consequence. However, I try to pass both the MAIN and SECONDARY WEFTS in the same direction as it helps me to keep track of where I am at). Now I need to create the shed for the lower layer of the double weave. Above left: I do this by placing a stick under all the white warps that I just selected (under which I just passed the MAIN WEFT). Note that the stick does not go under the tan border warps. Above right: I open the other shed, which in this case is the heddle shed, and place my sword under only the black and white warps in this shed…again, not under the tan border warps. Above left: I raise the stick and sword together which creates a new shed. You can see below the black warps and tan border warps which will form the lower layer. I am tipping my warp sideways in the photo so you can see. I place my sword within this new shed and beat. Then I pass the SECONDARY WEFT through this new shed also from right to left. I have it emerge from the shed and sit on the upper face of the weaving. I then open the heddle shed, place my sword within and beat. Now I will start again selecting all the white warps but this time from the heddle shed. I will discard their black partners as described at the start of this sequence of instructions. 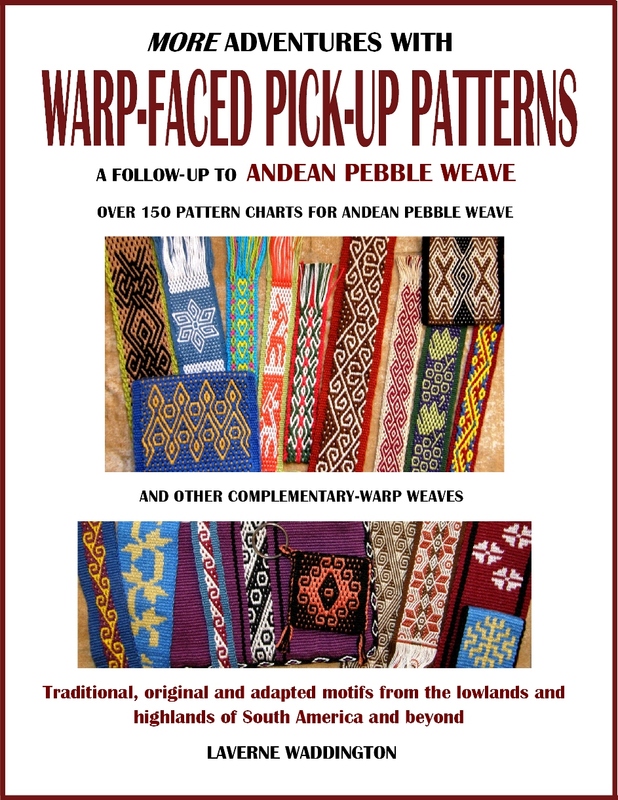 The instructions for reading the pattern chart and picking the pattern are the same as those in the one-weft double weave tutorial. Again, the only differences in this embedded technique are that you are using two wefts and that your borders are not being woven in double weave. Therefore, you do not include the border warps when you create the shed for the lower layer. Here are three short videos which complement these instructions…(they are very short as I made these ages ago for Flickr which has a 90-second limit on video clips). In these videos I am weaving a tan and black pattern with red borders. 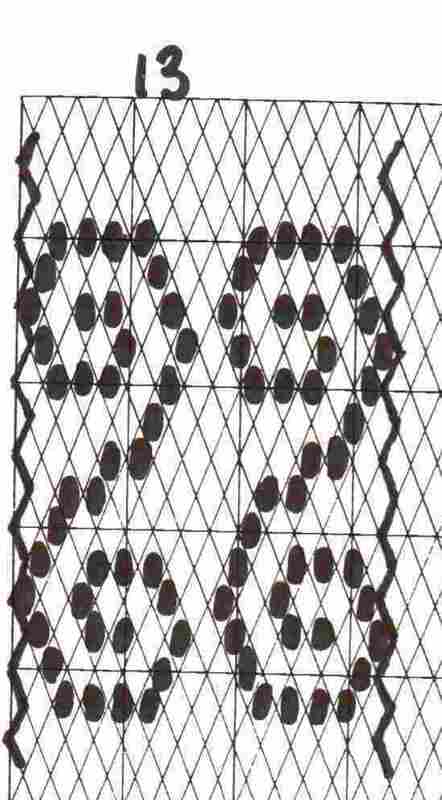 It is a 9-revolution pattern and my motif is a simple triangle and I show how to weave the base. This first video is an introduction and you could probably skip it if you have read my introduction above. The next video shows how to weave a plain tan background. In this last video I show how to weave the first row of a simple triangle motif. I am picking out the black warps that will form the base of the triangle on the tan background. 1.) Although I have not done so on the sample band I wove for this tutorial, the patterns in double weave generally look nicer if you wind a warp for the pattern area that is wider than the number of warps required to weave the motif. In other words, if your motif is 13 warps wide, wind a warp of 17 pairs so that your motif is flanked by two warps on either side. 2.) Sometimes the change from the double-weave area to the plain-weave can be abrupt and unattractive. To help smooth this transition it is a nice idea to warp two revolutions for plain-weave using the same color as the background of the double-weave section on either side of the double-weave. So, if your background is white and your motif black, wind two revs of white in plain weave on either side of the double weave area. Hello again! I’m going thru your double weave tutorials with my inkle loom. I’ve already done the alphabet and shapes from the one weft section. So much fun and so clearly taught. Thank you! My question is: how do I switch the background and pattern colors? Is it as simple as picking the color I want for the pattern or background, then switching these for the reverse pattern? Again, thanks so much! I can’t wait to try these and make my own patterns. Yes,you are right, Amanada. It is as simple as that! Thanks again for all the inspiration, instructions, and help! There isn’t any direct way that I know of to transfer a pattern that has been charted on stacked cells to the diamond graph paper. You just need to look at the shape of the letters and try to replicate that as closely as possible on the diamond paper. 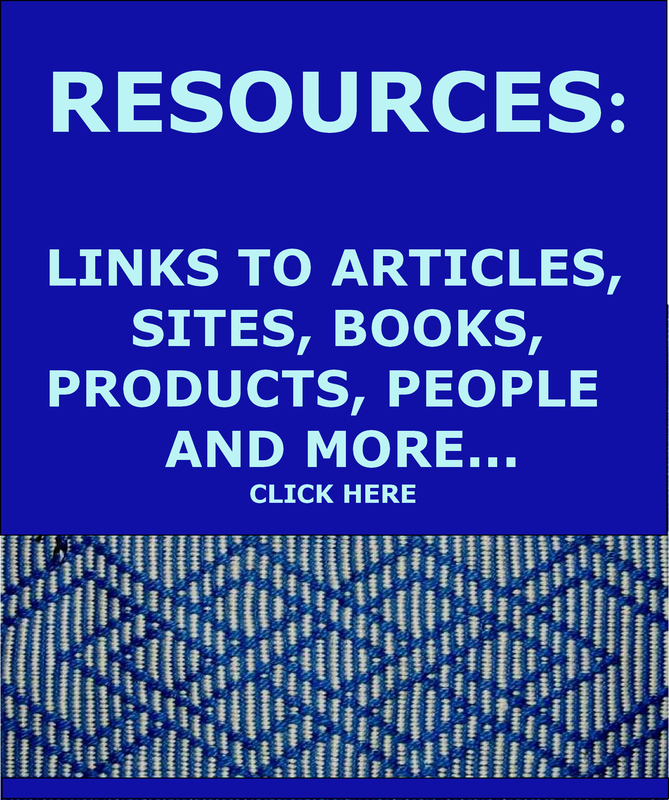 It’s all about trial and error… chart, weave, modify chart and weave again. Have successfully created one panel of the Llamas using embedded doubleweave and your pattern. My problem is that no matter how hard I try to do the beating, my Llama ends up almost twice as high vertically, as yours. I suspect it’s the yarn I’m using… #3 crochet. What type yarn, weight, etc did you use to do the weaving shown in the photo? I used a 2-ply merc crochet cotton similar in size to a #10 but not as tightly twisted as most crochet cottons. It might also be that you push your threads closer together than I do. Sounds good. Off to tomorrow to get some #10, and give it a try.